Kohima: On the issue of sheltering or returning Rohingya refugees to the country, the Supreme Court has postponed the hearing till November 21. But knowing this that Rohingyas are so circumcised for the Nation, your hair will be standing. Nagaland intelligence sources have confirmed that Imam of Dimapur is making contact with the Rohingya rebels and in addition collection of large quantities of weapons and ammunition from Bangladesh has been started. Describing Rohingya Muslim refugees as a threat to safety, Nagaland police intelligence department has warned that Rohingya can attack the people of Nagaland. According to the officials, if Nagaland people try to send Rohingya out of the country, then two (2) thousand Muslims people are ready to take up arms against the Naga people. Imam is planning to attack on Heibron and Kahoi camps so that it is easy to capture Nagaland. 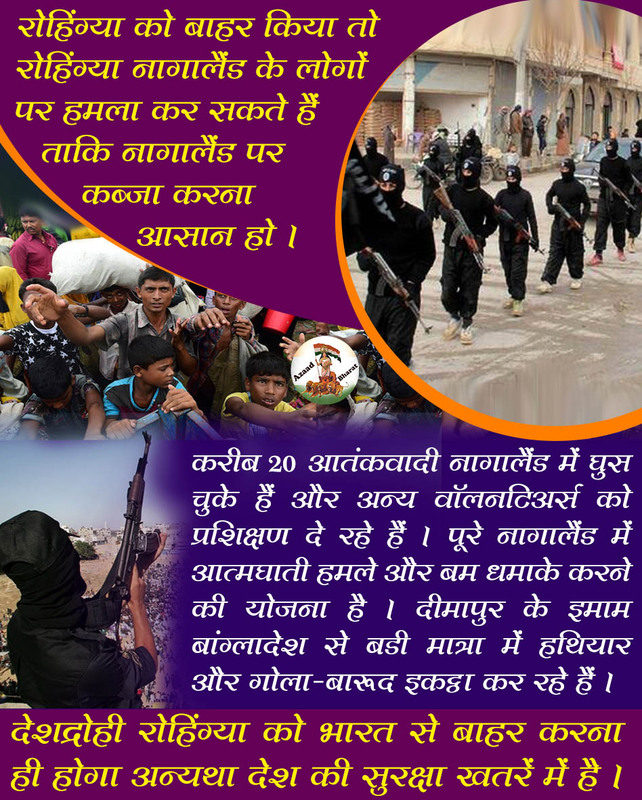 Not only those, nearly 20 militants of ISIS have entered Nagaland and are training other volunteers. There is a plan to commit suicidal attacks and bomb blasts across Nagaland. The administration has ordered the monitoring of the Muslims living in Dimapur. Retired General V.K. Gaud told that radical Islamic organizations have become active in camps. He said – ‘These people have chosen a large number of youth refugees to give weapons’ training. It is not necessary to say that there are some people in our army only who are supporters of ISIS and are against the friendship between India and Bangladesh. Let us tell you that we have information that millions of illegal infiltrators in Uttar Pradesh alone have changed their identity. To remove all these, the Yogi Sarkar has taken a firm decision that all of them will be taken out of the U.P by doing survey. In Myanmar, around 5 lakhs Rohingya Muslims have been thrown out. Why Rohingya is a threat to the country? 1. The refugees have links with terror organizations! 2. Rohingyas do not only encroach upon the rights of Indian citizens, but also are the challenge for security! 3. Social, Political and Cultural problems can be roused due to Rohingya refugees. 4. One thought behind this is that, the demographic form of India should be protected! 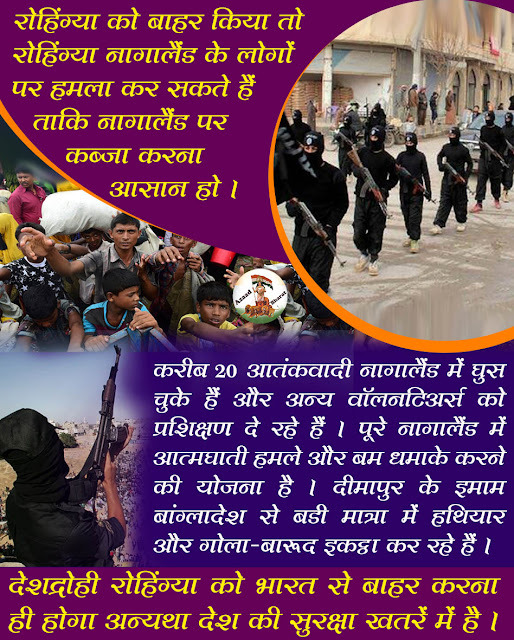 The point of the issue is that the way the intruders came to the country and have started to kill the people of the country in the name of religion or to increase their number, which can spread terror in the country that can lead to blood sheds, which is not the right thing for any country. All Indians can estimate how fair is the Government of India’s decision to take out Rohingya Muslims from the country with respect to the nation's security. But still the secularist volunteers, some politicians and some fanatic Jihadis support these Rohingya Muslims and are pressuring the Indian government to find refuge in India. Some jihadists have even threatened that even if someone touches Rohingya muslims, then India and Hindus will have to face serious consequences. All nationalists should now be organized and demand from the Indian government that along with Rohingya Muslims, illegal Bangladeshi intruders and even supporters of Rohingya Muslims should also be expelled from this country. Otherwise these people can bring distress on our existence in the future, so be careful now!